Roo: I bet you can climb trees, huh, Tigger? Tigger: Climb trees? Hoo-hoo-hoo-hoo! Why, that's what tiggers do best! Only tiggers don't climb trees, they bounce 'em! Come on, let's go! Hoo-hoo-hoo-hoo! Roo: [swinging on Tigger's tail] Don't swing on a swing. / It's much too frail. / The best kind of swing / Is a Tigger's tail. Whee! Roo: [swings off Tigger's tail to another branch] What's the matter, Tigger? Narrator: Wherever they go, and whatever happens to them on the way, in their enchanted place on top of the forest, a little bear will always be waiting. Narrator: And so we come to the last chapter, in which Pooh and Christopher Robin go to the enchanted part of the forest, and we say goodbye. br>Winnie the Pooh: Goodbye? Oh no, please. Can't we just go back to page one and start all over again? br>: Sorry, Pooh, but all stories have an ending, you know. br>Winnie the Pooh: Oh, bother. Christopher Robin: Pooh, promise you won't forget me, ever? Winnie the Pooh: Oh, I won't, Christopher, I promise. Christopher Robin: Not even when I'm a hundred? Winnie the Pooh: How old shall I be then? Christopher Robin: [chuckles] Silly old bear. Narrator: Winnie the Pooh lived in this enchanted forest under the name of Sanders, which means he had the name over the door in gold letters, and he lived under it. Winnie the Pooh: Hum dum de dum, hum dum de dum / I am so rumbly in my tumbly. Winnie the Pooh: [hits head] Ooh! Winnie the Pooh: [branch breaks] ... sweet! To eat! Rabbit: [hurriedly puts dishes away] Nobody! Winnie the Pooh: Must be somebody there, because somebody must have said "Nobody." Narrator: Yes, the time has come at last. Christopher Robin was heading off to school. No one else in the forest knew why or where he was going, just that it had something to do with twice-times, and how to make things called ABCs, and where a place called Brazil is. Rabbit: He budged! Hooray! "Chistopher Crabin!" Uh, uh, "Chrostofer Raban!" He bidged! He badged! He booged! Today's the day! Tigger: [while Roo is swinging on his tail] S-s-s-s-s-stop that, kid, please! Tigger: S-T-O-P! Stop! You're rocking the forest! Winnie the Pooh: [after the balloon he's flying on deflates] Oh, bother. I think I shall come down. Narrator: Now, the very blustery night turned into a very rainy night. And Pooh kept his lonely vigil, hour, after hour, after hour - until at last - Pooh fell fast asleep - and began to dream. Winnie the Pooh: Uh, R-Rabbit? Winnie the Pooh: Say, Rabbit, how would it be if as soon as we're outside of this old pit, we just try to find it again? Rabbit: What's the good of that? Winnie the Pooh: Well, you see, we keep looking for home, but we keep finding this pit, so I just though that if we looked for this pit, we might find home. Rabbit: Hm, I don't see much sense in that - if I walked away from this pit then walked back to it - of course I shall find it! I'll prove it to you! Wait here! Winnie the Pooh: But I haven't finished yet. Narrator: But Pooh, you're in the next chapter. Winnie the Pooh: Oh. Well, what happens to me? Narrator: Well, let's turn the page and find out. Tigger: T-I-double"guh"-errrrr, that spells Tigger! Narrator: Rabbit was now a humiliated rabbit, a lost-and-found rabbit, and a "Why, oh why do these things happen to me?" rabbit. Tigger: [Sitting on Pooh's stomach] And who are you? Winnie the Pooh: I'm Pooh. Tigger: Sure! Uh - what's a pooh? Winnie the Pooh: You're sitting on one. Tigger: Come on, Rabbit. Let's you and me bounce, huh? Rabbit: Good heavens! M-m-me bounce? Tigger: [joyfully] Why, certainly! Look, you've got the feet for it. Tigger: Come on, try it. It makes ya feel just grrreat! Rabbit: No, no, no, no, no! Not one drop! Winnie the Pooh: But Rabbit, I wasn't going to eat it. I was just gonna taste it. Rabbit: I'll taste it for you! Tigger: [ecstatic] Oh, I'm so happy, I feel like bouncing! Rabbit: Ah-ah-ah! You promised, you promised! Tigger: [falling back down sadly] Oh, I did, didn't I? You mean I-I can't ever bounce again? Tigger: N-Not even just - one teensy-weensy bounce? Rabbit: [defiantly] Not even a smidgen of a bounce! Winnie the Pooh: [in a sticky voice] I must be going now. Goodbye, Rabbit. Winnie the Pooh: [turns to leave then stops] Is there any more? Winnie the Pooh: I thought not. Winnie the Pooh: [tries to climb out the front door but is stuck] Oh, oh, help and bother! I'm stuck. Rabbit: Oh, dear. Oh, gracious. Oh. Well, it all comes from eating too much. Winnie the Pooh: It all comes from not having front doors big enough! Gopher: Good idea! We'll dynamite. Save time. Owl: Oh, no, no, no, the cost! The charge in money. Gopher: Well, I can't stand around lollygagging all day. I got a tight schedule. Gopher: [falls down a hole] Aaaaaaaahh. Gopher: If you think it over, let me know. You got my card, I'm not in the book, you know. Winnie the Pooh: After all, he's not in the book, you know. Rabbit: [to Pooh while hiding from Tigger in the forest] Shush! Eeyore: There's one. Cozy cottage. Nice location. Bit damp for Owl, though. Winnie the Pooh: Could you ssspare a sssmall sssmackerel? Gopher: Say, you ought to do sssomething about that ssspeech impediment, sssonny. Winnie the Pooh: [after rolling in mud] There, now. Winnie the Pooh: Isn't this a clever disguise? Winnie the Pooh: [looking himself over] I'm a little, black rain cloud, of course. Gopher: First thing to be done is, uh, get rid of that bear; he's jamming up the whole project. Owl: Dash it all, he is the project! Winnie the Pooh: I was afraid of that. Tigger: Yyyyyuck! Tiggers don't like honey! Winnie the Pooh: You mean elephants and weasels. Winnie the Pooh: Christopher Robin... I think the bees S-U-S-P-E-C-T something. Winnie the Pooh: The only reason for being a bee is to make honey. And the only reason for making honey is so I can eat it. Winnie the Pooh: Good morning, Christopher Robin. Owl, Kanga, Roo: Good morning, Pooh bear. Winnie the Pooh: Think, think, think. Winnie the Pooh: Winnie the Pooh? Winnie the Pooh: I like that. Let's do it all the time. Christopher Robin: You know something, Pooh? I'm not going to do just nothing anymore. Winnie the Pooh: You mean, never again? Christopher Robin: Well, not so much. Winnie the Pooh: I sure like bouncing. Wasn't that fun, Piglet? Piglet: Y-yes, but the best part is when it stops. Narrator: Well, in the next chapter, there's a great deal of bouncing. Piglet: There is? Oh. I-I have something I forgot to do today, and I shaln't be able to do tomorrow, so I 'spose I have to go back and do it n-now. Good-bye, Pooh. Narrator: No, it's mostly about Tigger. Narrator: But you're in it. Winnie the Pooh: Oh, good. What will I be doing? Narrator: Well, Pooh, you'll be sitting in your Thoughtful Spot, thinking as usual. Christopher Robin: You're next, Tigger. Jump! Tigger: Er, jump? Tiggers don't jump, they bounce. : Then bounce down. : Don't be "ridickorous"; Tiggers only bounce up! : You can climb down, Tigger. : Ah, but tiggers can't climb down, uh, uh, because, uh... oh, oh their tails get in the way! : Hooray! That settles it. If he won't jump, and he can't climb down, then we'll just have to leave him up there forever! Tigger: Oh, well, please, for goodness' sakes, narrate me down from here. Winnie the Pooh: You said that. Tigger: Oh. Well, did I say I was hungry? Winnie the Pooh: I don't think so. Tigger: Well, then I'll say it: I'm hungry. Piglet: Pooh, for a bear of very little brain, you sure are a smart one. Winnie the Pooh: Thank you, Piglet. Tigger: Well, I gotta go now. I've got a lotta bouncin' to do. Tigger: T-T-F-N: ta-ta for now! Winnie the Pooh: [to his reflection] Is it raining in there? It's raining out here, too. Winnie the Pooh: Christopher Robin, can you make a one-hero party into a two-hero party? Christopher Robin: Of course we can, silly old bear. Tigger: I "recognize" you. You're the one that's stuffed with fluff. Winnie the Pooh: Yeah. And you're sitting on it. Tigger: Yeah. And it's comfy, too! Tigger: [looking at his reflection] Oh, hey, hey. Look, look, look. Oh, what a strange-looking creature. Mmm, look at those beady little eyes, and that "purrposterous" chin, and those "rickydickorous" striped py-jamas! Winnie the Pooh: Looks like another tigger to me. Tigger: Oh, no, it's not. I'm the only tigger. Tigger: Watch me scare the stripes off of this imposter. Tigger: Is-Is-Is... Is he gone? Winnie the Pooh: All except the tail. Winnie the Pooh: He's gone. Piglet: I don't mind the leaves that are leaving, it's the leaves that are coming. 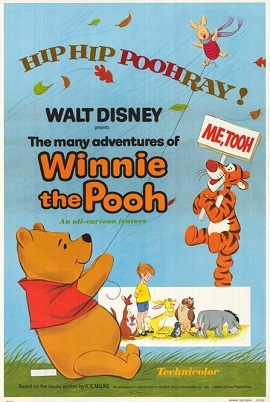 Winnie the Pooh: Happy "Winds-day", Piglet. Piglet: [being blown away] Well... it isn't... very happy... f-for me. Piglet: That's what I'm asking myself, where? Winnie the Pooh: [grabbing Piglet's scarf] And what do you think you will answer yourself? Owl: This is just a mild spring zephyr compared to the big wind of '67. Or was it, uh, '76? Oh, well, no matter. Oh, I remember the big blow well. Piglet: I'll remember this one, too. Owl: It was the year my Aunt Clara went to visit her cousin. Now, her cousin was not only gifted on the glockenspiel, but being a screech owl, also sang soprano in the London Opera. Winnie the Pooh: [as Piglet shoves a honey pot into his face; muffled] Thank you, Piglet. Owl: You see, her constant practicing so unnerved my aunt that she laid a seagull egg by mistake. Oooooohhhhhh! Winnie the Pooh: Well, isn't that the Rabbit's voice? Rabbit: [talking into a honey jar] I don't think so. It isn't meant to be. Eeyore: W-O-L, that spells owl. Owl: Bless my soul, so it does. Rabbit: [drawing on Pooh's backside when he's stuck in Rabbit's door] Oh Pooh! You messed up my moose! Winnie the Pooh: [to his reflection] Oh, hello. Am I glad to see you. It's more friendly with two. Now, you go that way, and I'll go this way. Winnie the Pooh: [walks away from mirror, then runs back] You didn't see anything, did you? Neither did I.